PYC Bearings offers a full line of standard and many specialty and custom designed thin section ball bearings to the aerospace industry and all major OEMs. PYC's thin section ball bearings are offered in radial contact, angular contact, 4-point contact and sealed radial contact designs. These bearings are offered in ABEC 1 through ABEC7 precision grades, pre-loaded, corrosion protected, grease-lubricated, and are available with numerous separator, ball, shield, seal, and lubrication options. 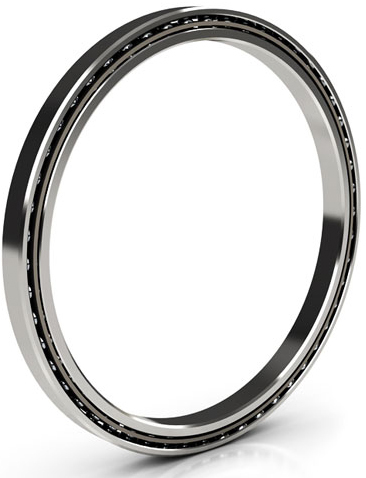 Standard thin section ball bearings have SAE 52100 steel rings and balls. PYC thin section ball bearings can be manufactured from other specialty bearing steels to provide corrosion resistance, high temperature capability, alternative load capacity, or chemical compatibility. PYC has manufactured thin section ball bearings from SAE 440C stainless steel to provide corrosion resistance. As an alternative to CRES rings, the entire surface of the rings can be plated with nodular thin dense chrome (TDC). This plating, which meets AMS 2438, achieves a molecular bond that will not flake, peel, or separate from the base material. Special PYC thin section ball bearings have been manufactured from aluminum, 300 series stainless steel, 17-4PH and other metals. Some special ball materials include CRES 440C, 300 series stainless steel, silicon nitride, and M50 steel. PYC supplies thin section ball bearings with many different lubricants depending on the application requirements. Greases that are designed specifically for high speed, low torque, water resistance, high temperature, and oscillatory motion can be provided. Additional lubricants, such as dry film, are suitable for use in vacuums and space applications. Radial play (diametral clearance) can be adjusted for mounting fits or temperature changes. Pre-loads can be ground into the bearings to increase or decrease loads to meet particular application requirements. In addition, mounting features, such as flanges, anti-rotation tabs, and mounting holes can be incorporated on the inner and outer rings. PYC thin section ball bearings may be customized to meet your application's demanding requirements. Thin Section Radial Contact Ball Bearings Bore sizes 1 to 40inches . Thin Section Angular Contact Ball Bearings Bore sizes 1 to 40inches . Thin Section Four-Point Contact Bearings Bore sizes 1 to 40inches . Sealed Thin Section Radial Contact Ball Bearings Bore sizes 4 to 12inches . Sealed Thin Section Four-Point Contact Bearings Bore sizes 4 to 12inches . Custom Thin Section Bearings .